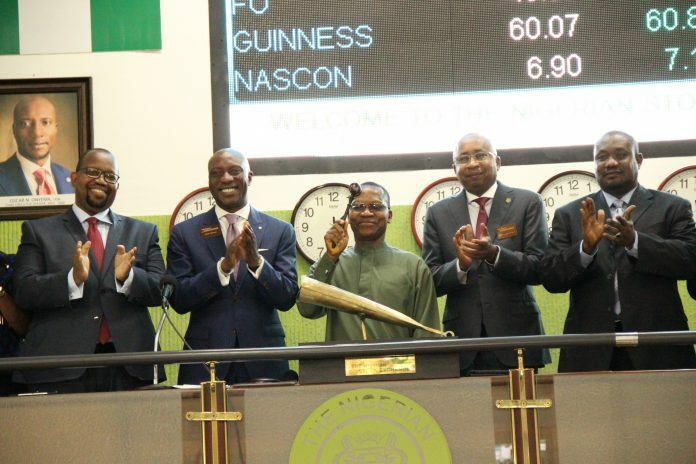 The Debt Management Office, DMO, yesterday, listed 2.1 billion (2.067.961,000 ) units of FGN savings bond series 1 on the Nigerian Stock Exchange, NSE, just as 100,000 units were traded after listing. This is even as the Federal Government, yesterday, announced a 7.5 per cent yield on its $500 million euroband. Speaking during the listing, Director-General of the DMO, Dr. Abraham Nwankwo, commended Nigerians for participating in the first issuance of this bond on March 13, 2017. He said: “This is the first time that the Federal Government ensured that the common Nigerians participate in a bond and about 75 per cent of these deals were from ordinary Nigerians. “The Savings Bond, the first of its kind in Nigeria, was opened to investing public by way of offer for subscription over a five day offer period starting from Monday, March 13, 2017 to March 17, 2017 and N2,067,961,000 was raised from the retail market at 13.01 percent coupon. We look forward to continue the collaboration with DMO to list subsequent series of the Savings Bond”.